They feel let down by farming, the 31-year old García explained, so they pack their belongings and flee. “After four years of bad harvests, they don’t want to plow this land anymore,” the farmer said. “They want to leave for the U.S., or work in assembling factories in the city, or do something else—just not in here”. Like García’s friends, young people from Latin America’s northernmost countries are abandoning their hometowns in response to drought. They are doing so at faster rates than any other age group, thus changing social and economic dynamics and foreshadowing national and international displacement that a warmer world might bring. 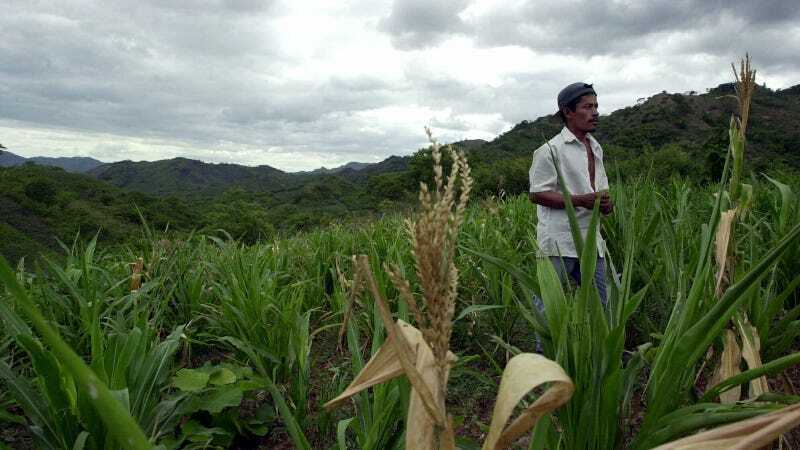 A study published in December determined that water scarcity is pushing 15- to 25-year-olds out of their hometowns, like García’s Los Apoyos, located in the hilly heart of El Salvador where his cooperative grows maize, beans, papaya, and plantain. “If you were to have the equivalent of a moderate drought scenario in the United States, you might have 41,000 15- to 25-year-olds moving in response." Researchers from the World Bank, the International Food Policy Research Institute (IFPRI), and the University of Illinois poked through census data and disaster records of eight nations across northern Latin America and the Caribbean looking for evidence that dry spells might augment migration solely within each country’s borders. “If you were to have the equivalent of a moderate drought scenario in the United States, you might have 41,000 15- to 25-year-olds moving in response,” said IFPRI senior research fellow Valerie Mueller. The study compiled information from Costa Rica, the Dominican Republic, El Salvador, Haiti, Jamaica, Mexico, Nicaragua, and Panama. Based on the data, it’s unclear what ultimate influence this migration might have, but unplanned displacement can impact these countries’ social fabric, forcing teenagers and 20-somethings into low-paying jobs far from home. A friend of García’s, for instance, relocated to nearby Santa Ana, the second largest city in El Salvador, and earned around $200 a month in a factory, barely enough to scrape by. García would have advised him otherwise. “It’s better to live in the field, where we eat beans and maize that we harvest and don’t have to pay rent,” he said. The cooperative leader lives with his partner and their two kids, a 12-year-old girl and a 2-year-old toddler who enjoys playing in the farm’s wildflowers. They haven’t moved because the land still provides sufficient income to support their needs. But others don’t have such an appealing or obvious choice. “In distress migration, you might take a job that, at the moment seems it like has a high return, but over the long-term you might actually be worse off." “In distress migration, you might take a job that, at the moment seems it like has a high return, but over the long-term you might actually be worse off”, Mueller explained. Many farmers throughout Central American ended 2014 and 2015 empty handed after a rainless season killed their maize or bean fields, for which many had already become indebted. Small family-owned farms constitute a major income for many Central Americans across the isthmus’ rural areas, where subsistence agriculture remains a ubiquitous presence. This makes the region’s economies especially vulnerable to unreliable rain patterns and temperature rise, both expected to be severe consequences of climate change. According to United Nations data, the El Niño-linked drought of 2014-2015 left more than 3.5 million people suffering from food insecurity and economic hardship in El Salvador, Honduras, and Guatemala alone—about 10% of their combined population—adding more pressure to an already conflicted area. Before talking with García, I had heard similar stories from other Central American youth along the U.S.-Mexico border, where I covered the growing number of unaccompanied children reaching American soil in 2014. Even though most were fleeing violence, many people in shelters spoke about failing farms and the dire prospects of making a living in the countryside. Their flight north wasn’t captured by the IFPRI analysis, Mueller explained, as national census data only accounts for internal displacement across regional boundaries. Say a Nicaraguan coffee farmer moved to a nearby village within the same province or a Guatemalan factory worker headed up north to the United States; this wouldn’t register in the study’s data. “This is probably a lower-bound estimate of what we might actually see,” she said. However, the analysis did identify where young people relocated. It determined that they weren’t flocking to country or regional capitals, but rather to non-urban areas. Mueller believes this is positive, as it prevents a massive exodus of people to cities already hampered by crime and unemployment. This gang-related violence, along with systemic corruption and poverty lines above 50% in places like Honduras or Guatemala, are the other main driving factors influencing people’s decisions to make the challenging move elsewhere. During drought events, Oxfam’s García has witnessed rural families consuming the food reserves they had set apart and selling whatever livestock they might have before migrating, particularly in Central America’s so-called “dry corridor”. In these areas drought has slashed maize and beans harvest by 90%, pushing families to the limit. The large number of people that get by on subsistence farming in countries like Honduras and Guatemala means circumstances like this can have acute impacts on rural communities, Oxfam’s García explained. When water is scarce, García said, people move to wherever there’s work, oftentimes selling off their land and thus deteriorating their economic stability. Garcia’s organization and many others are calling for national and regional authorities to increase resiliency and preparedness—including around climate change—and hoping politicians tackle the structural causes of poverty and food insecurity in Central America. Mueller’s research team tested whether aid had an impact on youth displacement and found out that development assistance does reduce these patterns. “What would be interesting is to see the targeted development programs that agencies are investing in and understand to what extent they are reducing distress migration patterns,” she said. In 2016, the European Commission delivered €3 million to support drought-impacted communities in Honduras and Guatemala, and U.S. aid pledged after the unaccompanied migrant crisis has targeted economies and communities along with its initial security-focused agenda.